This is a pair of mid century modern pottery lamps with shades. The lamps are beautiful splashes of blue and green. Dimensions: 11″diameter x 29″H to finial. These are 2 mid century modern bullet floor lamps. The first is in a cool avocado color. Each brass accented lamp is adjustable and can be lit individually and simultaneously. The second floor lamp has white glass shades with the same adjustable features. The table also has a built in side table with an inlaid top. This is a selection of mid century modern pottery lamps. Please check captions for prices and availability. We have great industrial pieces. Storage, tables, lighting, and more. These are 2 mid century modern floor lamps. The first lamp has vibrant multicolored glass shades and teak accents: 63″H x 11″base diameter. The second is a bullet floor lamp in a great avocado color with brass and meta lamp shades. Both floor lamps have the ability to light 1, 2 or all 3 lights simultaneously, and can change lighting positions. The third is a retro globe lamp with a bamboo birdcage shade and attached glass table. Dimensions: 60″H, Table diameter: 16″. All floor lamps are sold. 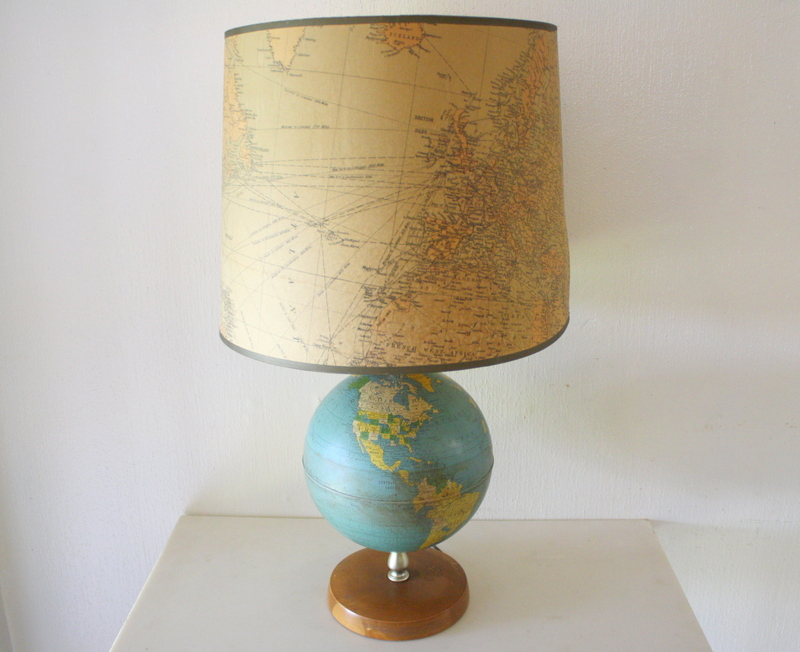 This is a vintage globe lamp with a matching lampshade. It takes standard light bulbs. Dimensions: 24:H x 6.5″diameter. 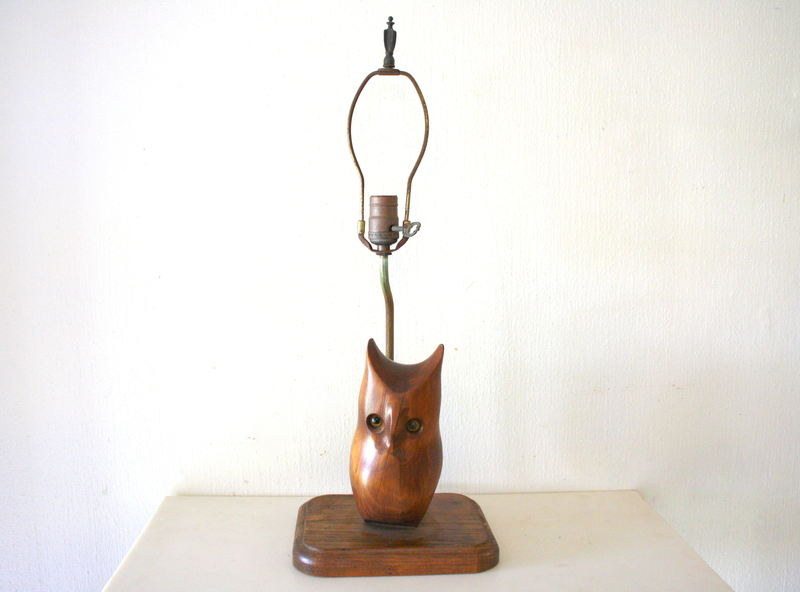 This fun vintage owl lamp is made of solid wood and takes standard light bulbs. Dimensions: 9″W x 7″D x 24″H. These are a selection of mid century modern lamps. The first has teak flower petals and milky white glass shades. 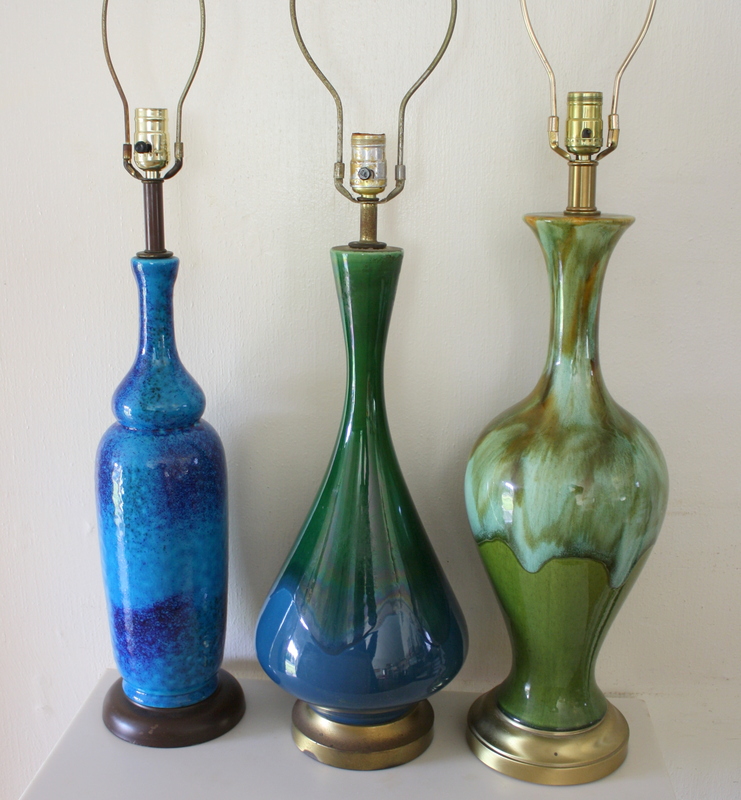 The second is a pair of mid century modern pottery lamps in a vibrant blue and green. 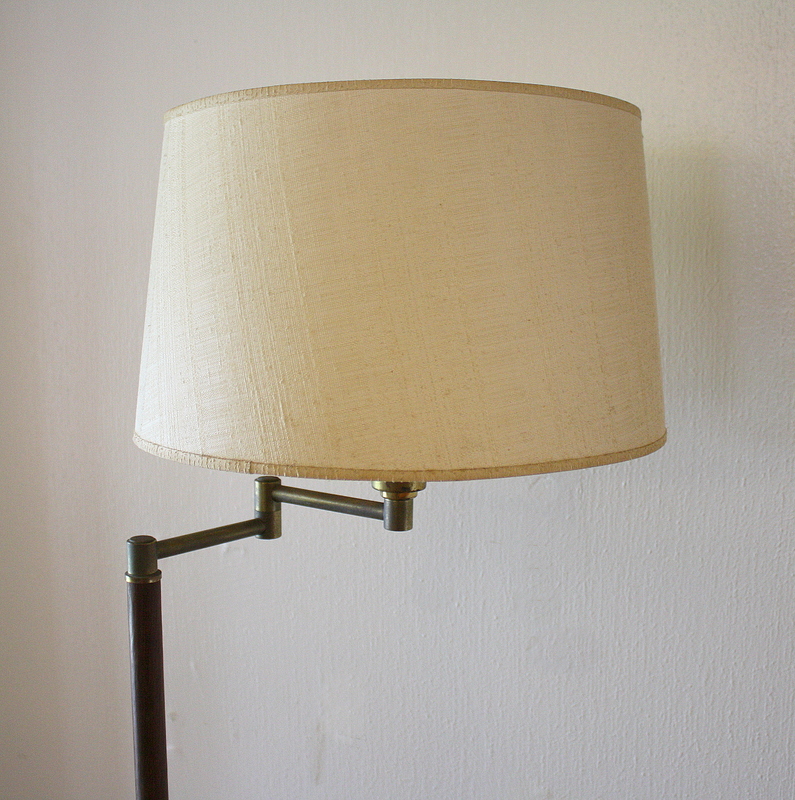 The third is a brass and teak table lamp with a matching shade. The fourth is a hanging woven pendant light with gorgeous illumination. The fifth s a fiberglass table lamp with a fiberglass shade. These are 3 pairs of mid century modern pottery lamps with teak stems. The first pair has gorgeous blue pottery bases. The second pair has a floral patterned pottery bases.. The third pair has white speckled pottery bases with art deco arches. All pairs of lamps are sold. These are mid century modern floor lamps with very cool built in tables. The base is solid wood with a tile topped side table. Great for small spaces and accents, these floor lamps have a cool look and dual function. This is a mid century modern pottery lamp. It is a rich warm color with a woven design. It comes with a retro cream lampshade that accents the lamp’s design and adds to its illumination. This is a mid century modern teak and brass lamp with glass shades. It has three bulbs and a beautiful tapered design. This a mid century modern sculptural lamp with beautiful entwined wood. The base is made of solid wood and it takes a standard size bulb. There is also a pair of mid century modern lamps with a “tulip” design. They are made of solid wood and take standard sized bulbs. 1 Sculptural lamp available is sold. 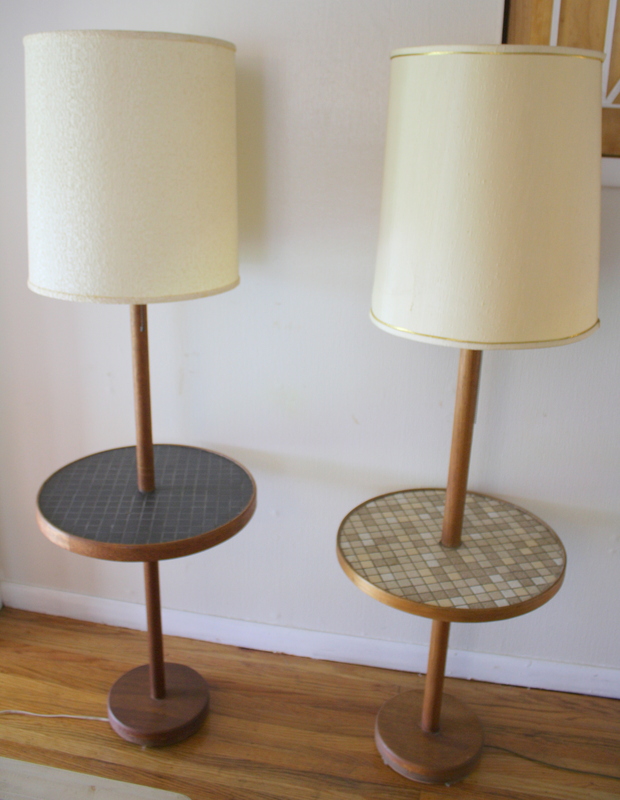 These are two mid century modern swing arm floor lamps. They have wood accented metal bases, with adjustable swing arms and cylindrical original shades. This gorgeous piece is a mid century modern pendant floor lamp table combination. The table is low slung to match and compliment the low slung sofas of the time. It has three splayed legs. The pendant has a solid wood frame around the tear drop light fixture. It hangs from a metal stand attached to the table. 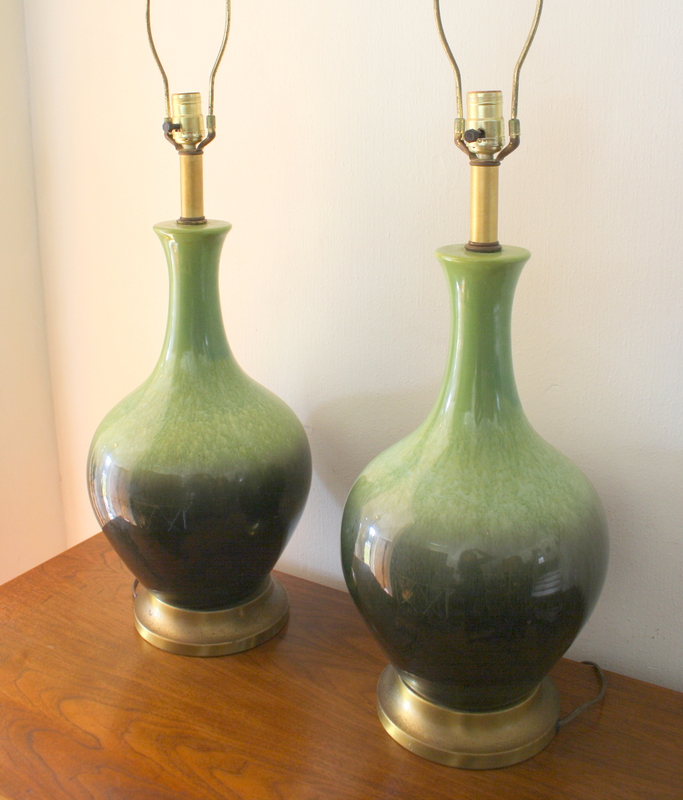 These are two pairs of mid century modern drip glazed pottery lamps in chocolate brown and aqua green. Pair of chocolate brown lamps sold. Pair of aqua green lamps sold. 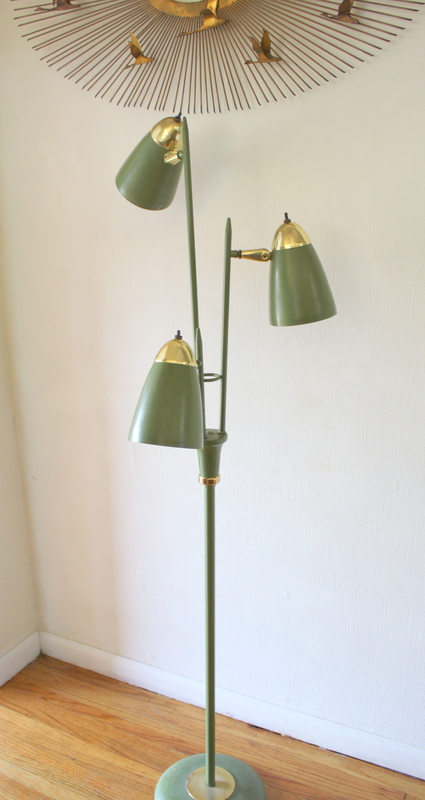 This is a mid century modern tension floor lamp with three lights. In the hood of each bullet light, there is a cut out pattern that illuminates. The lamp stretches from the floor to the ceiling and is held in place by a tension rod. Very fun piece, great retro accent! This is a mid century modern bullet floor lamp and desk with bullet desk lamp. The floor lamp is made of steel with brass accents. There are 3 lights that all light up individually. Very retro, very sleek. 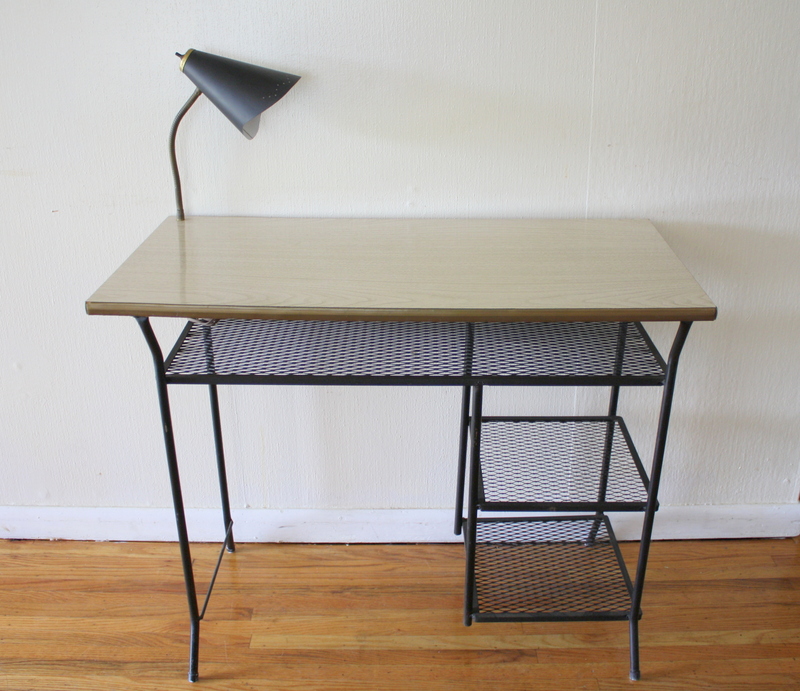 The vintage desk has a built in bullet desk lamp and cast iron base with shelves. This is a retro globe lamp with a really cool bamboo birdcage shade and attached glass table. Definitely one of the cooler table/lamp combos, it works perfectly and illuminates the room. Give your space that special glow. This is a vintage standing iron lamp with a built in magazine holder. It is made of cast iron, has a scrolling design, and works perfectly.